Faircroft is outstanding self-catering accommodation in Rhossili on The Gower Peninsula. This spacious property was fully refurbished in 2002 and has consistently been maintained to a very high standard. The interior comprises of a spacious entrance hall, kitchen, dining room, lounge, three bedrooms (one en-suite) and family bathroom. Set in a large, well maintained garden which is mostly laid to lawn, the property enjoys extensive views over to Devon and The Worm’s Head to the front and Rhossili Down to the rear. The house enjoys WiFi*, full central heating and has ample parking for four cars. The kitchen is fully fitted and tiled throughout and has all the pans, crockery and cutlery you would expect from 5 star accommodation. The electrical appliances include a cooker, microwave, dishwasher, washing machine and fridge freezer. A hand blender is provided, as is an iron, ironing board, pegs and clothes airer. The dining room seats six people comfortably and is light and airy with a wooden floor and beech furniture. There is a mini hi-fi in here (with CD, radio & cassette player) and a separate PURE radio with audio lead to connect to your iPod/iPhone. There are fantastic views over the sea from this room. The lounge also has a great sea view. There are two leather settees, and a television (with digital TV). It is a beautiful room that combines a clever mixture of classic and contemporary decor. The master bedroom overlooks the sea through a bay window. It has a luxury 5ft oak framed bed with 1500 pocket spring memory foam mattress. There is plenty of storage space and all bed linen is provided. The second bedroom which is a double, has en-suite facilities with a shower, hand basin and toilet. The twin room has two single beds and a wardrobe. The bathroom is tiled throughout and includes a spa bath with overhead shower. Hand and bath towels are provided for up to six people. Guests should provide their own beach towels. Thank you for providing such a wonderful base at Faircroft in which to explore glorious Gower. We had all we could ask for…the large garden was perfect for running around with the footballs. Had a fabulous week – house is really lovely and couldn’t ask for a better location. Very comfortable, spacious and well thought out accommodation and scrupulously clean – well deserving of the 5 star rating. Thank you… for giving us such a wonderful experience with your beautiful accommodation and constant helpfulness! We’ll definitely recommend this place to our friends and hope to come back again in the future! Thanks for your warm welcome, help and footballing prowess. We’ve had a great holiday. Will be recommending you and Faircroft to family and friends. Great holiday, we have fallen in love with this wonderful area. This house is so comfy and warm, everything we needed was there. Thank you for a lovely holiday home, we will be back sometime I’m sure. Have special requirements? Call Dai Cann on 01792 390616 or 07826 196697. 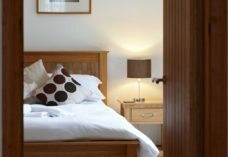 Short breaks are sometimes available out of season, as are discounts for 2 person occupancy. Please enquire for more details.